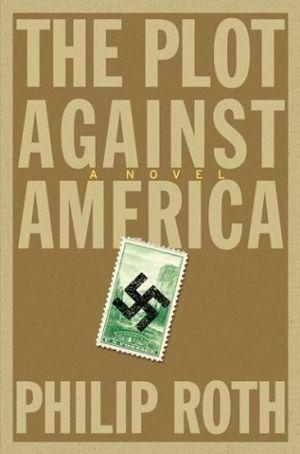 I recently read The Plot against America by Philip Roth (2004), a gripping historical novel, a genre that I always enjoy for the challenging light that it sheds on both the past and a present that could have been marked by a different past. Roth takes two and a half years out of US history—from June 1940 to November 1942—to build a rather plausible alternative scenario. The hero aviator Charles Lindbergh, playing on the popularity of his 1927 trans-Atlantic flight and his isolationist philosophy, triumphs as a Republican presidential candidate over FDR and installs an increasingly tyrannical and racist regime abetted by the watchful eyes of the FBI and its interrogators. I don’t recall it being mentioned in the book, but the plot’s plausibility is enhanced by the fact that Lindbergh’s father served as a Republican congressman from Minnesota from 1906-16 and adamantly opposed US entry into World War I. The novel has its heroes, who like the anti-hero Lindbergh were actual historical figures. The outspoken radio commentator Walter Winchell speaks truth to power until he is assassinated. New York mayor Fiorello LaGuardia, orating at Winchell’s funeral, evokes Sinclair Lewis’s novel It Can’t Happen here (p. 305: “It can’t happen here? My friends, it is happening here”). And FDR, after recovering from his 1940 defeat, wins a special election in 1942, after Lindbergh’s disappearance, in time to rejoin his historical role of leading the US in World War II. I suspect that Roth must have drawn on the 1933 “Business Plot” or “Wall Street Putsch” against FDR, foiled by West Chester native Gen. Smedley Darlington Butler, whom I mentioned in a recent blog. The Business Plot was an alleged political conspiracy in 1933 in the United States. Retired Marine Corps Major General Smedley Butler claimed that wealthy businessmen were plotting to create a fascist veterans’ organization and use it in a coup d’état to overthrow President of the United States Franklin D. Roosevelt, with Butler as leader of that organization. In 1934, Butler testified before the United States House of Representatives Special Committee on Un-American Activities (the “McCormack-Dickstein Committee”) on these claims. In the opinion of the committee, these allegations were credible. No one was prosecuted. That Wikipedia post (which, as often, keeps evolving) mentions Jules Archer’s 1973 book The Plot to Seize the White House, about the Business Plot, as well as Sally Denton’s 2012 The Plots Against the President: FDR, A Nation in Crisis, and the Rise of the American Right. The similarity of these titles to Roth’s seem to suggest an influence. …Roth has stated that the idea for the novel came to him while reading Arthur Schlesinger, Jr.’s autobiography, in which Schlesinger makes a comment that some of the more radical Republican senators of the day wanted Lindbergh to run against Roosevelt. The title appears to be taken from that of a communist pamphlet published in support of the campaign against Burton K. Wheeler’s re-election to the U.S. Senate in 1946…. Up until the melodramatic unraveling of the Lindbergh regime, this is an appealingly convincing excursus into the possibilities of US history, already replete with plenty of horrors from slavery to, as Roth amply brings out, anti-Semitism as witnessed by the 8-year-old central character who just happens to be named Philip Roth. One would like to be able to say that the “reeducation” and “redistribution” plans to “Americanize” Jewish Americans can’t happen here, but one would be optimistic, judging from the Native American and Japanese American experiences. Still, as in history, Roosevelt emerges from both plots–the one denounced by Butler and the one imagined by Roth–in his essential historical role as the powerful leader at the time he was most needed. Well, that is the judgement of scientists who investigate matters of fact in the most objective way they know. Unfortunately, only a small number of them become convincing public spokespeople for their positions, and fewer still leave their day jobs to become politicians. Meanwhile, when it comes to global warming, the investigative talents of the latest crop of Republican congressional leaders is anything but objective. Of course, that does not stop many of them from loudly voicing their opinions – opinions now coupled to the wielding of power. Consider the following short list…. In 1958, Fred Koch, the founder of the Midwestern oil and cattle ranching empire that would become Koch Industries, became a charter member of the John Birch Society, the fiercely anti-communist organization whose members believed Soviet influence was infecting all aspects of American society. The Birchers attempted to place their weight on “the political scales…as fast and as far” as they could, but their movement was quickly sidelined to the ideological fringe. Two of Fred’s four sons, Charles and David, have carried forward the conservative torch, and they have succeeded where their father and his allies failed. Their father’s company, meanwhile, has grown into a multibillion-dollar conglomerate that is the second-largest private corporation in the country. Though the Koch surname has become synonymous with political spending, the family’s philanthropy has flowed to a wide range of causes. A significant portion has gone to think tanks and policy institutes that advance the brothers’ free-market beliefs. And Charles Koch has lavished millions on universities to bolster their study and teaching of this school of economics. But Koch contributions have also established cancer research centers, funded ballets and preserved cultural institutions, and provided grants and scholarships to students. The political network overseen by the conservative billionaires Charles G. and David H. Koch plans to spend close to $900 million on the 2016 campaign, an unparalleled effort by coordinated outside groups to shape a presidential election that is already on track to be the most expensive in history. The spending goal, revealed Monday at the Kochs’ annual winter donor retreat near Palm Springs, Calif., would allow their political organization to operate at the same financial scale as the Democratic and Republican Parties. It would require a significant financial commitment from the Kochs and roughly 300 other donors they have recruited over the years, and covers both the presidential and congressional races. In the last presidential election, the Republican National Committee and the party’s two congressional campaign committees spent a total of $657 million….